Sumatra was our next and final island in the Indonesian archipelago and by all reports it was not going to be all that easy. Traversing Java had left us weary. The nature of the traffic in this populous island belies words. Close encounters with greasy, black smoke-breathing trucks and buses left us looking like chimney sweeps at the end of each day. We could remember little of the sights except for memorable potholes or near misses in the traffic. The highlights of Mt Bromo, ancient Borobodur and Prambanan, jolly Jogykarta and a welcome rest in Jakarta were mere punctuation marks in a long ride of tedium. Although less populous, Sumatra has a reputation for deplorable GPS-confusing road conditions, land slides, wash outs and long distances between hotels. We were warned of bandits on particular roads which could rob you of everything including bikes and clothes. So upon leaving for Sumatra on Christmas Day we had a steely outlook in preparation for a rough ride. Danau Toba was our only real destination before heading to a new country reputed for offering better roads. Little else was in our plans but to cross Sumatra as painlessly as possible. Day two in Sumatra on the Trans Sumatran Highway and it seemed little was different from Java. Traffic was lighter, but we still breathed the noxious fumes in the smoke clouds of laden trucks and buses crawling up hills before us. The daily downpours had returned which also meant slow travel. But things were to change. In the morning, we had passed a small group of bikies clad in club vests and protective gear. They sported top boxes and gear strapped to their bikes, marking them as touring. Late morning we stopped for a rest and coffee in a roadside warung and just as we were about to leave, in walked the bikie group and it seemed they were looking for us. Throughout most of the world being approached by bikie characters clad in vests adorned with badges and a club motif you might feel afraid. Not so in Sumatra! 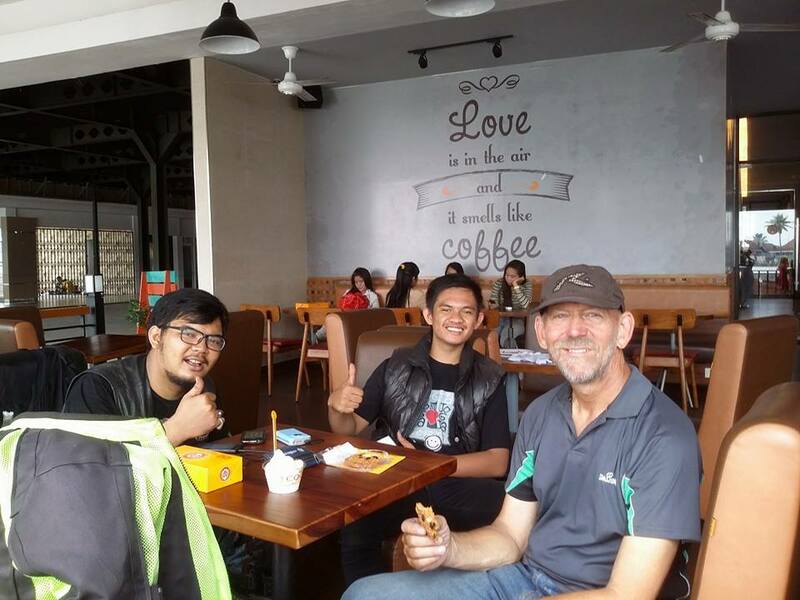 This chance meeting with a biker community (not club) was the beginning of our love affair with Sumatra and one which has given us a unique insight into the warmth and friendliness of Sumatran people. We were about to begin a journey where local bikers guided us across the island. We became precious cargo being shepherded to the next town where accommodation was offered, food was provided and friendship freely given. 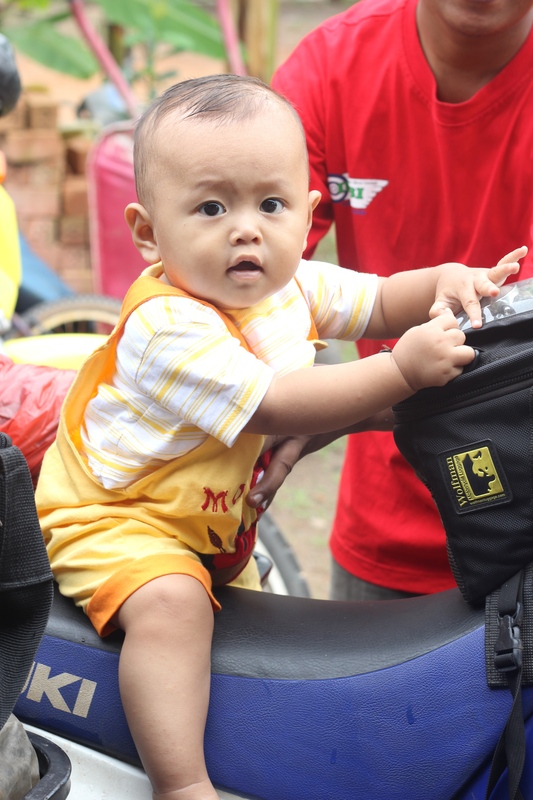 We had discovered the brotherhood of bike communities across Sumatra. This group of bikers had been to Bali for a Honda Bikers day and were returning home. 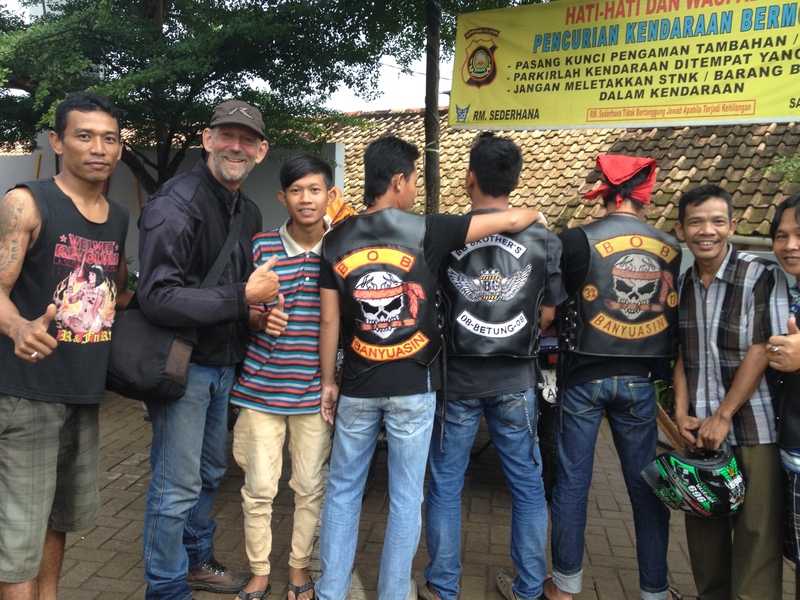 The roads of Sumatra are their backyard so we were delighted when Sam, the leader, invited us to ride with them. Little did we know where that invitation would lead. Upon joining the group we quickly realised there was a protocol of riding involving hand and leg signals. Riding in a group means you have to pretty quickly adapt to their speed and protocols. Being third in line, I was privy to the leader’s signals first hand and initially was confused as to who the signals were for, me or the crazy drivers who still drove in the maniacal way we had come to know in Java. The leg signals looked like exercises for a saddle sore rider and I thought maybe I the leader was in charge of rider safety. Hand signals made more sense as messages to follow along in single file, slow down, stay where you are and stop became obvious. Regardless of the meaning, I knew each rider was expected to pass the signals down the line. So that’s what I did. The other members peeled away as we rode through their home towns, so we were left to ride with Sam. Sam willingly led us along the road, tirelessly signalling us, not realising that at this stage we didn’t know what many of the signals meant. We just followed him through the traffic mayhem and along the highway which didn’t look like a highway. Sam was soon to become known to us as Sam+1, because his travel times seemed to be a bit rubbery. Well Sumatra is known for ‘rubber time’! The day riding turned into night riding as we navigated one of the worst highways I have seen. Sealed roads were punctuated by muddy, slippery potholed sections more akin to an off road adventure. The rain also came at dusk which made the sharing of the road with the trucks and buses even more challenging. Finally pulling into town in the darkness, we were relieved to be off the road. However, as always, the challenge of finding a hotel was daunting as we were tired and wet, but one which had become part of our daily ritual. The Biker community however, were there to greet us. With little fuss and minimal English we were escorted to a hotel, a family business of a local biker. A lovely clean and quiet hotel it was and all for gratis! 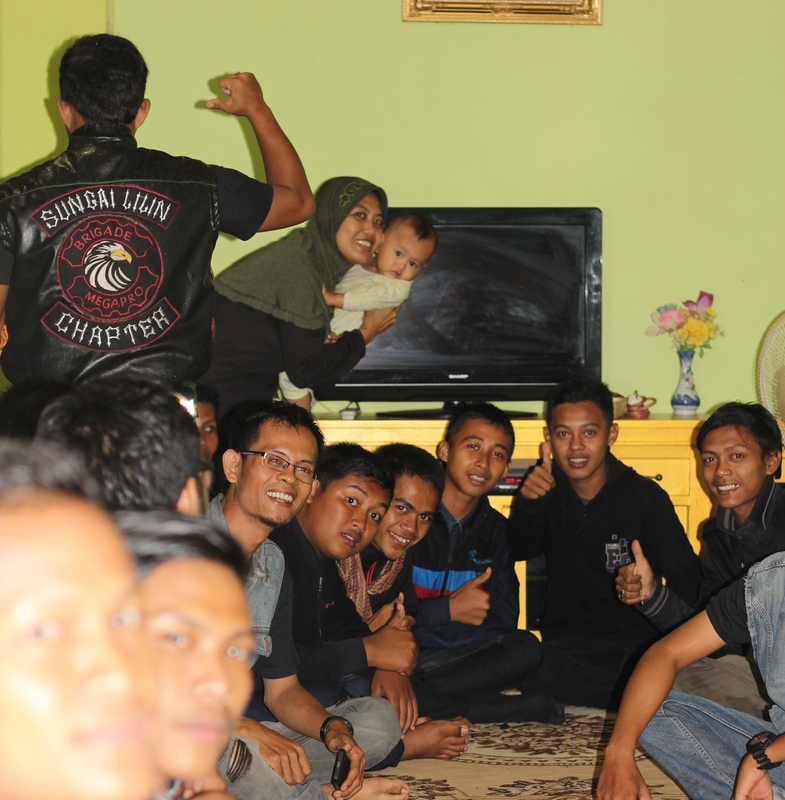 That evening we were surrounded by local bikers who bought us dinner and Bingtang! They weren’t drinkers, as is very common across Indonesia, but delivered two cans to us at our hotel. Such hospitality was given with smiles and good humour as we posed for photos and swapped stickers. Many thanks to Hotel Fajri, Kayuagung for such warm hospitality. The next morning we were escorted out of town by the club members in true club style with a leader and tailman. Navigating the busy cities is so much easier when riding in formation and also when you don’t have to rely on a temperamental GPS to get you lost. The actions of these amazing Bike Communities had just made our trip so much more fun, social and easy and was also the beginning of us getting to know the people of Sumatra at a deeper level. Day two took us further along the Trans Sumatran Highway on slightly better road conditions. It was without incident and finally we could begin to look around. Our guide, Sam led us through South Sumatra to our first stop where somehow Blackberry Messenger was used to let more bikers know we were on our way. 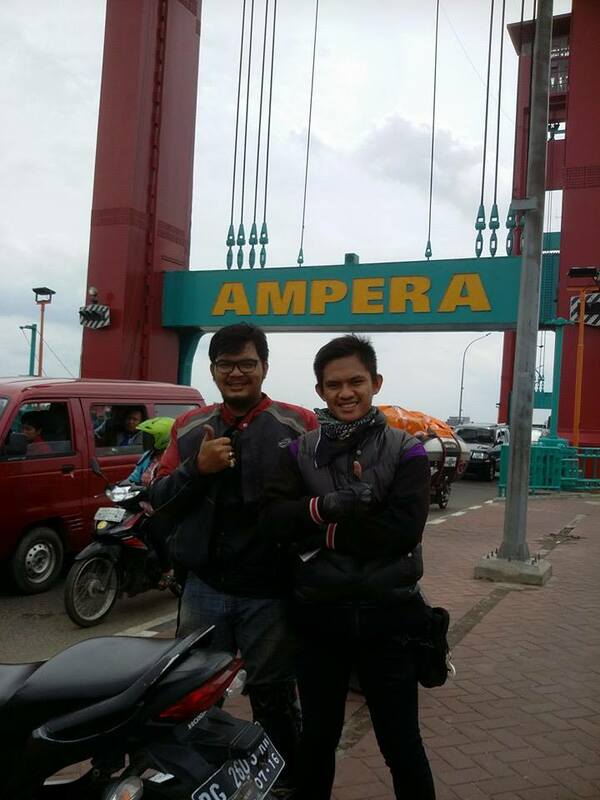 After looking at the impressive Ampera Bridge at Palembang we stopped for coffee and to find more “friends” wanting to meet us, give us club stickers and to photograph us! This type of a welcoming party was repeated at our lunch stop with the meeting of members from Banyuasin. Biker communities proudly associate themselves with their home area and bike brand. Our final destination for the night was at Kyuangung Ili, The River of Candles, and once again we were given a warm welcome, but this time into the home of a beautiful family. More community members gathered to meet us and traditional food and coffee was shared late into the night. People slept on the floor alongside us and we woke to breakfast awaiting us and more welcome coffee, photos and sticker sharing. Four days into crossing Sumatra we felt like our trip was in another world. The roads were still challenging, but our focus had been shifted from the road conditions to the amazing people we were meeting. Despite the language barrier, we were able to share jokes, laughs and meals with a sense of community and care. We had become passengers on our own journey and the days were filled with large gatherings of friendly, warm and caring people who were delighted to shepherd us through their towns. We were part of the brotherhood. 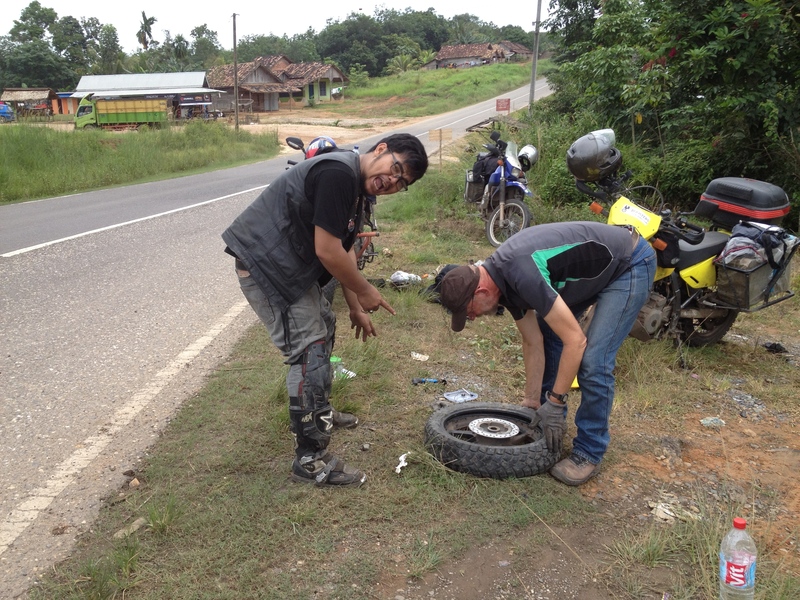 On our way towards Jambi travelling through palm oil plantation country, Sam had a rear flat. Luckily we were carrying a compatible spare tube and so we were happy to repay his kindness with the help of changing his flat and donating our spare tube to him. As always coffee was available across the road, so whilst Con changed the flat, I provided the coffee! With the flat tyre in the mix, our day was looking like it might include more night riding. Sam was on a timeline to be home for New years Eve and so he had to keep going. On the other hand we are supposed to be on holidays and night riding is no fun, so we reluctantly decided to part ways in the large city of Jambi. Following a coffee in the late afternoon we said our goodbyes and we were once again on our own. We took off in search of a hotel recommended by the Lonely Planet guide to Indonesia. We had let go of the support system of the bike communities and we instantly regretted it. We were once again foreigners in a foreign land and our whimsical GPS began playing its old games as we set off down an obscure road to nowhere.